I downlaoded and tested it. Installing is smooth and easy, and I also installed the new POSKY model. I have to reinstall the liveries again, because i thought it's better to delete all and start from scratch. You say you need your file for first synchronisation. When you pick PSX as slave, the PSX will be moved to the runway in your scenario. If you pick P3D as slave, i stand the wrong way around in Zurich, because the plane is turned in a wrong direction. Now my question: Can i alter the File you made? So I could move and turn the plane with the slew function of Prepar, load my B747 I need and save it as new default, or would that break something needed for the synchronisation? Thanks for your help and have a nice weekend. I am unable to log in to WideSimulation or to change my password. When you pick PSX as slave, the PSX will be moved to the runway in your scenario. If you pick P3D as slave, i stand the wrong way around in Zurich, because the plane is turned in a wrong direction. Now my question: Can i alter the File you made? So I could move and turn the plane with the slew function of Prepar, load my B747 I need and save it as new default, or would that break something needed for the synchronisation? Beat, I think the things are even easier. You don't need to slew the P3D aircraft to go to the wanted location. The "PSX is slave" function is designed to avoid this kind of boring things. Of course you can change the location, and even the aircraft livery from the P3D welcome screen, from the template scenario, before to "Go Flying". It is written in the scenario description. This way your P3D aircraft will be placed at the exact wanted position and heading, right in front of the gate. Then start the Scenery Generator Bridge with "PSX as slave" selected. You P3D aircraft will not move, and PSX position will be set to your P3D aircraft position. If you plan to always start from the same P3D location, you can re-save this new scenario. I don't think it will be an issue if you are only changing the location and eventually the livery. But I will prefer the first solution which will always make your P3D starting from my approved scenario, and change the location and livery from the P3D welcoming start screen. It only takes a few seconds. I hope this answers your question. Merci beaucoup! Le logiciel mis à jour a parfaitement fonctionné. I just tried Version 2.0 on a short test flight from KDTW to KJFK, using P3D 4.4, with the PSX-specific Posky model and startup scenario. I also used ASP 4 weather injection into P3D with upper winds being sent to PSX. The new L1 door animation worked correctly, and I did note that the movement of the P3D aircraft is indeed noticeably smoother in taxi and in flight. The approach to KJFK runway 31R was quite turbulent in PSX with gusty surface winds, and the P3D aircraft movement matched the PSX aircraft flawlessly. The only issue I had, (which has nothing to do with WidePSX), was that there are many new RNAV SIDS at DTW which do not yet appear in the PSX FMS database, but that should be corrected when the annual PSX nav data update comes out next month. On my next flight I will try the new ground handling module. Thank you very much for your feedback Jim, and congratulations for your perfect French writing ! I am happy you enjoy this new version's smoothness. I have downloaded the trial version. If I wish to purchase do I have to register? If I wish to purchase do I have to register? No. Select "Add to cart" on the WidePSX registered product page, then place your mouse on the little basket (top right) without clicking. Then select the yellow "Paypal Checkout" icon. It will link you directly to the Paypal website. Congrats to the major update! And thanks to the new P3D situation file, I discovered a new airport (LRQQ) which I‘ve never seen before. Will there be a discount for users who already purchased the first version? No discount necessary, ALL the updates, even major like this one, are always sent for free to all the registered users. I will never charge for any update. I send the updates to the PayPal email adresses people used to buy the product. Did you receive my email ? If you changed your address you have to let me know at info@widesimulation.com in order to update my database. I purchased your product yesterday and I didn't receive any email about the link for downloading your product? After the purchase completed the download may start automatically. Maybe your browser blocked the download. I just sent you an email with your download link. Thank you. Ok I saw your email. I will look for this on this day. Did you run the .msi file like described for the 1st P3D v4 installation in the user manual ? You may have the connection to SimConnect ok, but not the data transit if there is something wrong with the SimConnect.xml configuration. A big thank you for your help on this. V2.0 is now installed and running really smoothly! 1. Yesterday on ILS approach to SVMI Rwy 10, WidePSX was showing it had applied the offset to that runway, but I was visually to the left of the centreline (PSX ILS centred) and had to shunt across - a bit like the approach to 22L at JFK. I am using P3D and AS with no scenery add-ons yet, and thought I had followed the instructions on setting up the .csv file. Any advice? 2. After landing and at the gate, door 1L and cargo doors opened as expected but all other doors remained in automatic, not manual. I did have PSX BACARS connected. Is there some conflict here, possibly, or is there something I’d overlooked. 3. Unconnected with WidePSX (I think), P3D display flashes briefly every 5 to 10 seconds, rather as if a black strobe is overlaying the display. Otherwise it runs with complete fluidity. I’m totally new to this program - any advice as to what I can do to get rid of this effect? 1- There is a special procedure for the P3D v4 users, described in the MakeRunways manual. Did you follow this procedure ? WidePSX compares the position of the PSX and P3D thresholds. From this difference it applies the corresponding offset. If the position is wrong somewhere (probably in the runways.csv file) the calculation is wrong and the offset is wrong. 2- I don’t know if this add-on is doing something with the doors. The first think to do is to try without it. 3- Never saw and never had report of this. As you said WidePSX was disconnected. I have just doubled checked the BACARS code and we do not write anything to the door variables, so shouldn't be that. I run WidePSX and BACARS and I didn't had any problems with the door. What caused troubles was when i started PSX Net to use the FMC to operate the doors. Mabe if PSX.net runs toghether with BACARS I could imagine to cause troubles. We run PSX.NET and BACARS in the sim all the time together. 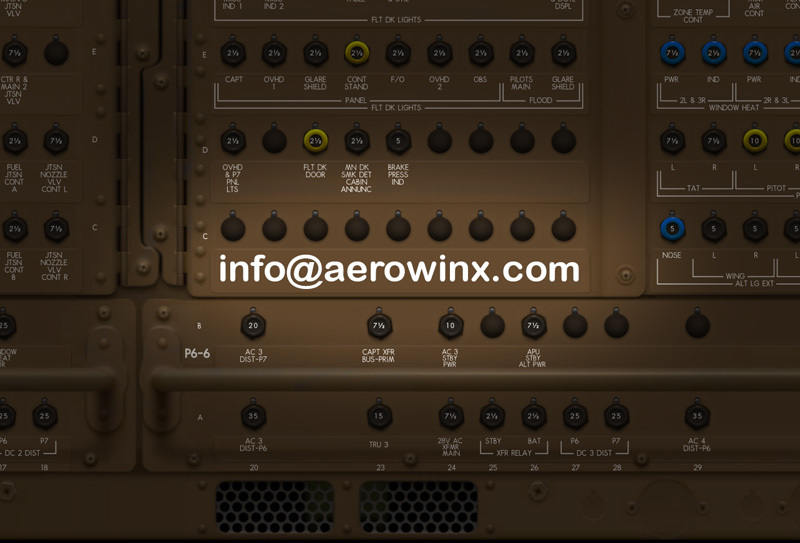 Perhaps its PSX.NET that fights for the same control at WidePSX, we obviously use ExternalSim for our 'ultra smooth in-flight graphics display' visuals link and have no such problems, as we use PSX.NET for the automatic door/external power hook up instead. 1. Yes I followed this. In case something was wrong I have just repeated it and generated a new .csv file - i’ll see if that solves the issue. 2. I have now used PSX.net to set everything to manual - perhaps trying this out the other day caused some confusion to WidePSX. 3. I’ve solved his with a quick google search - just for the record: I enabled Triple buffering and Vsync in the settings and reduced the Target Framerate. All normal now - phew.